It might not look the most glamorous of tractors and it’s certainly not tackling the most glamorous of jobs, but the new TAFE 45DI recently delivered to an 850 cow dairy enterprise in Surrey performs as crucial a role as any other power unit on the farm. "This is our fourth TAFE tractor," points out Paul Knight of Norwood Place Farm. "It's just replaced the first one we bought seven years ago, which is now ready to be retired to standby duty, and has a cab this time to keep us dry in all this rain!" The Indian-built tractors are progressively replacing elderly models on the farm, like the MF135 and MF240. Replacements are now in short supply and getting long in the tooth for purposeful work. 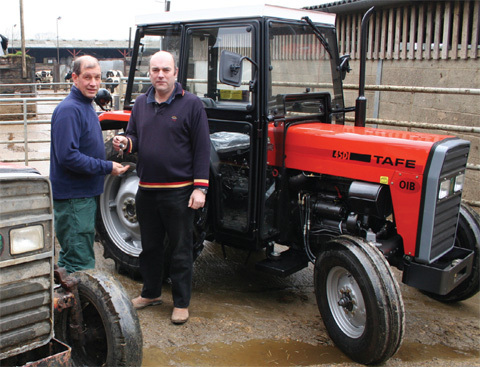 "Buying second-hand tractors for scraper duty used to be common practice but it’s getting harder to find a nice little MF or something similar for sensible money," says Martin Richards of TAFE importer Tractors UK. "A low hours example in good shape coming off a vegetable farm will fetch £7,000-£15,000 at auction because of interest from collectors," he points out. "And if you do get one, you’re starting out with a part-worn machine running with drum brakes when you can have a brand-new TAFE tractor with oil immersed brakes for around £11,000, with two years' or 1,000 hours warranty." Four examples of this simple tractor work on all three of the farms run by Paul Knight and his family. The mainly British Friesian cows, averaging 7,000 litres, are block calved in the autumn for yearround management ease, fed 1.5 tonnes of cake a year in the parlour, and munch on maize and grass silage dispensed in blocks into troughs. All forage is grown on the 1,500 acres (607ha) of heavy Weald clay farmed by the family, with more than 200 tonnes of straw bought in to bed cubicles for milkers and heifers. It falls to the little TAFE tractors to chop and dispense the bedding and keep the tight cubicle passageways, feeding area and collecting yards clean with a scraper of the farm's own design. "I'd rather run a new tractor that's reliable than keep spending out repairing an old one we bought second-hand." "It was built as the Gross scraper at one time but now we have them made locally to different layouts depending on whether customers want to push or pull when scraping," says Mr Knight. "It's a really heavy-duty build for durability, thick replaceable rubbers for a long service life and pivots at the back that allow the sides to 'flex' over uneven concrete." Despite the scraper’s substantial build, the 37hp TAFE 35DI being retired has handled the implement easily enough, so it's a doddle for the more powerful TAFE 45DI, which itself is more than a match for a drum-type straw chopper. "The chopper doesn’t take a lot of driving and once the tractor is ballasted appropriately to carry the weight it handles it easily enough," says Mr Knight. The tractors on scraping duties spend about three and a half hours a day on this job during the winter months before having a holiday in the mid-July to August quiet period leading up to calving. Their small size and nippy two-wheel drive manoeuvrability is a real boon in the narrow passageways and around the cluster of buildings. "I'd rather run a new tractor that's reliable than keep spending out repairing an old one we bought second-hand," says Mr Knight. "If we have to repair anything it's usually because the nut behind the wheel hit something rather than a problem with the tractor!" Parts are easy to obtain, he adds, either from the Dorset-based importer or from local dealers. The tractors might have the look – and sound – of a classic from the past, but the TAFE models supplied in Britain are specced to handle their modern role. "Oil-immersed disc brakes were developed for paddy fields but are ideal for the conditions that a scraper tractor has to work in – they're just the same as in an MF165," explains Martin Richards. 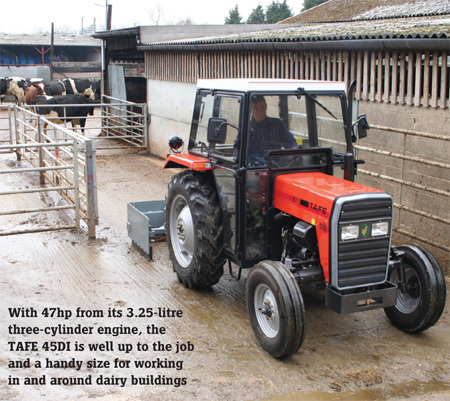 "Also, we have the heavier-duty telescopic front axle fitted, which is similar to an MF350." The simple gearbox, with its eight forward and two reverse gears, is ideal for the scraping job too, adds Paul Knight. "On tractors with unmatched gears it's a two lever job to change direction, so the driver usually ends up slipping the clutch all the time and burning it out," he says. "But high third and reverse are well matched on the TAFE and all it takes is a flick of the gear lever to go from one to the other."